According to Global Mobile Report 2016, more than 90 percent of global app installs are organic. That’s absolutely massive, and it’s data from apps that for the most part are being actively marketed. This data is enough to show why marketers shouldn’t focus on paid app advertising alone and ASO is equally important too. The main difference between App Store Optimization (ASO) and App advertising is that installs coming from ASO are free, while installs from ads are not. Although Apple and Google’s algorithms for app visibility in the stores are still under covers, there are a lot of best practices and tactics, which have been established through good old-fashioned testing and learning. Seemingly minor adjustments to titles, descriptions, keywords and visual listing elements can result in measurable improvements. In this article, we will try to explain the major differences between app advertising and organic app store optimization and also how both go hand in hand. We all know that both app store and play store are flooded with apps with numerous options present in each category. Android users can choose between 2.8 million apps. Apple’s App Store has about 2.2 million available apps. Moreover, it’s not only because there is too much competition, but because customers are searching for those apps. Apptentive reports that the majority of potential customers use search queries or browse through top charts and featured listings to find their apps. According to the head of search and discovery for Google Play, Ankin Jain, 12% of all daily active users are looking for apps on a daily basis. And a whopping 50% of these DAUs (daily active users) search for apps at least once a week. Over the course of a month, Google Play processes six million unique search phrases. App Title: This is perhaps the most important element. With a maximum of 30-50 characters (Attention there was a switch in character limits), tell users what your app does in the most concise way, or you risk them moving on to the next. App Description: Finding the balance between too much and too little information here is key. Don’t sell yourself short, but ensure you cover off all the important bits whilst maximizing your keyword count. App Keywords: Choosing the right keywords requires understanding your market, your competitors, and popular search phrases. Choose keywords that are relevant to high search frequency. App Reviews and Ratings: We know that your app’s ratings and reviews have a significant effect on your ranking. Thus making the analysis of your reviews to gain insights a crucial step in ASO. Understanding how users view your app can give you insights, and help to identify key themes. App Logo and Screenshots: Capture the user’s imagination with your logo and screenshots. Your logo should stand out from the crowd. And think of your screenshots as another space on which to advertise. They don’t necessarily need to be in-app shots. Since people tend to gain information out of your images, make them informative and convincing. App Category: Choosing a primary and secondary category for your app can lead you to the right user. It can also boost your app ranking depending on the level of competition in that category. There isn’t a “one and only” user acquisition method; there are many ways to acquire new users: Social Media, Video Ads, ASO, Incentivized installs / referrals, E-Mail Marketing, Banner Ads, App Cross Promo, etc. Successful apps combine different methods for User Acquisition, whether it be paid user acquisition like through app cross-promotion, banner ads, etc. or whether you are acquiring users through organic ASO campaigns. By using a single channel approach, you cannot analyze user data such as which channel performed better, what caused user retention and what was the average acquisition cost. Investing in all channels can help marketers utilize different types of media devices and platforms in order to secure optimal pricing and campaign optimization. ASO helps acquire users through the place to go when it comes to downloading apps: the App Store itself. Through optimizing discovery within app store searches, top charts or featured section, you can be found by a higher number of users who might be willing to download your app. Whereas, if you focus only on paid advertising, it is less cost-effective and poor for customer retention. When it comes to decreasing cpi costs, most marketers overlook ASO because somewhere we think, ASO is not related to cost of conversions. However, what most marketers overlook that the traffic which is redirected via ads ultimately lands on the app page in the app store. If the CPI is high that means the traffic didn’t convert after landing on the app page. Why didn’t it convert? The answer is poor optimization of the app page. This is where the importance of ASO comes in. In order to reduce the CPI, you need to optimize your app page. 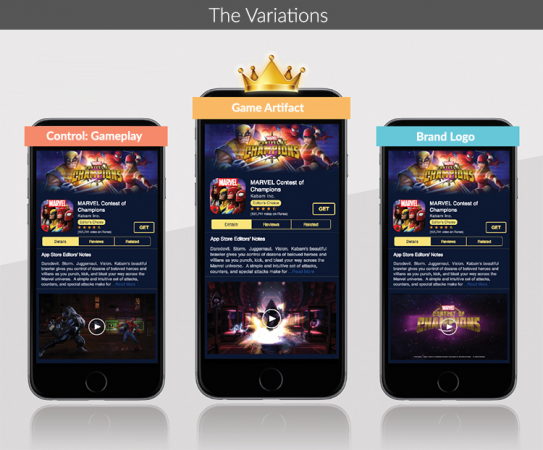 Here is an example of how Kabam, a gaming app tested three versions of their app page. The winner version led to 66% increase in app install conversions and highly reduced the CPI costs. In order to cost-efficiently bring your app to the customer, it’s not only important to target the right audience but to be flexible and creative in creating ads and to keep an overview of all your campaigns. That’s what Clickky’s Self-Serve Platform for Mobile Advertisers offers. Till now we were discussing how ASO is important for app install ads to work. Now let’s see how ads affect your ASO. The app store algorithms see download velocity as a major signal for good app quality; So, acquiring downloads from other sources beyond ASO is of importance to earn significant growth. Although installs improve your mobile app ranking, it’s not that simple. App installs which only result in swift uninstall and bad reviews are not desirable, especially looking at Google Play rank. Engagement is an important parameter for ranking. Quality installs are critical for good ASO, among other parameters. Poor quality users that often result in bad reviews can actually drag down your ranking and make your app look bad by lowering view to install conversion rates. That’s why it’s suggested to use quality channels to run ads and stay away from cheap incentive based ads. Further, while app advertising is often used to earn initial downloads for new apps, ASO is the best way to acquire organic users, which tend to be the most loyal ones. Reaching users when it matters is the key. 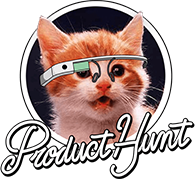 You have to reach your users at the very moment, they are looking for your app. Now there are two ways to do it: ASO and App Install Ads. App Store Optimization is crucial to make your app visible in app store search. Similarly, correctly optimizing your app install ads can give you the same results too. Here is an example of both working out for different situations. 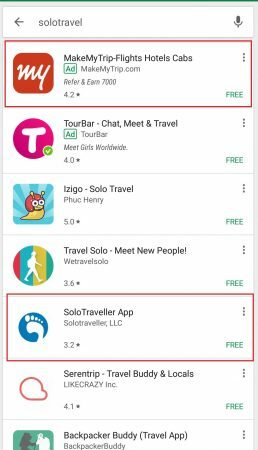 When searching for “Solo travel” in the play store, this is the result you get. Here, makemytrip.com is appearing in the result via correct targeting of keywords whereas the SoloTraveller app is appearing due to great ASO. There are two types of potential audiences here. When someone is searching for solo travel they might be looking for hotels and flight bookings. Here MakeMyTrip serves the purpose. While the other segment is of users looking for other solo travelers company. This is where SoloTraveller cashes in. This shows that when done correctly, app store optimization and app install ads compliment each other and therefore none of the both should be ignored in any case. To conclude, the success of any app cannot be defined by one parameter or via one source. When done correctly, all marketing efforts complement one another. If your app ads are running successfully it’s imperative that you use other channels to leverage your app’s full potential. This post was brought to you by Silke Glauninger, Marketing Manager at App Radar, an app marketing software that helps developers and marketers all around the world growing their App Store Optimization at scale.